BB Chronological 29: BB #13 – Riddle of the Sphinx! Jeff Weigel’s fantastic character The Sphinx was back to star in Big Bang Comics #13, published by Image Comics in the late summer of 1997. 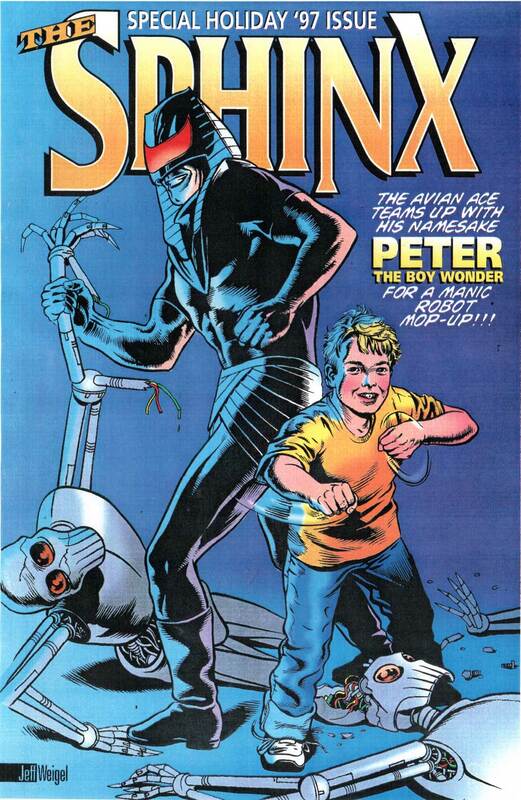 The Riddle Of The Sphinx was a novel length 40 pager that filled BB #13 from cover to cover. 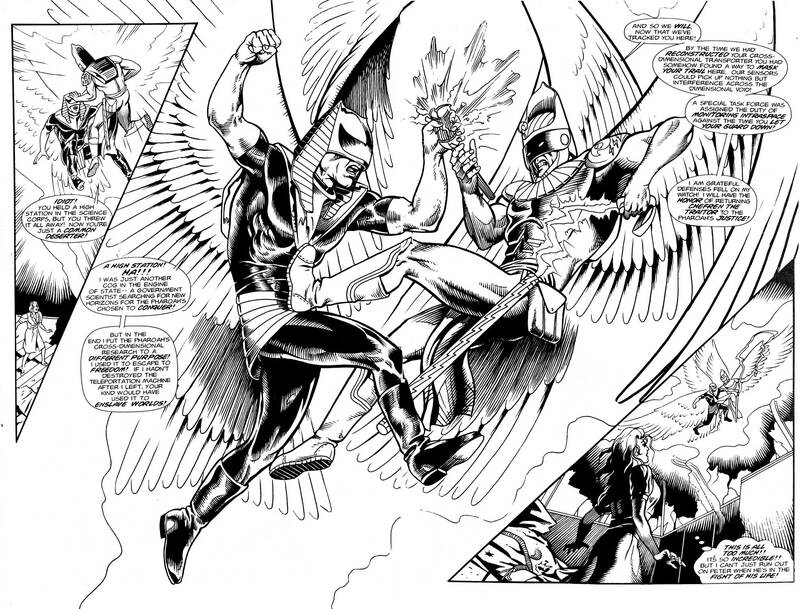 The Sphinx had already appeared in the 9 pager Deeds of the Doomsayer in BB #9, but the epic here in Big Bang #13 was written and drawn over two years earlier. I met Jeff Weigel at the Chicago ComiCon in 1995, where he handed me an ashcan copy of Riddle Of The Sphinx to show me samples of his work. To say that my mind was blown would be an understatement. Jeff’s work was GORGEOUS! The story was great, the storytelling classic, he penciled like Curt Swan and inked like Murphy Anderson! And the Sphinx himself was a nice character, a clever Hawkmannish fellow with wings, yet not as blatantly homagey as we were doing at Big Bang. At the time, we were either still at Caliber Press or making the move to Image, and had only published 5 issues and a few earlier back up stories. I think Jeff initially feared that we were simply ripping off DC Comics, but the issues I gave didn’t scare him away. He did a few faux covers and agreed to pencil the Ultiman/Knight Watchman story for the Image BB #3. Next, Jeff agreed to let the Sphinx sort of join the Big Bang Universe. He wrote and drew the short story in issue #9 to introduce the character, and then allowed us to run his original epic here in Big Bang #13. (The Sphinx returned in issues 20 and 23, but those are stories for another day). 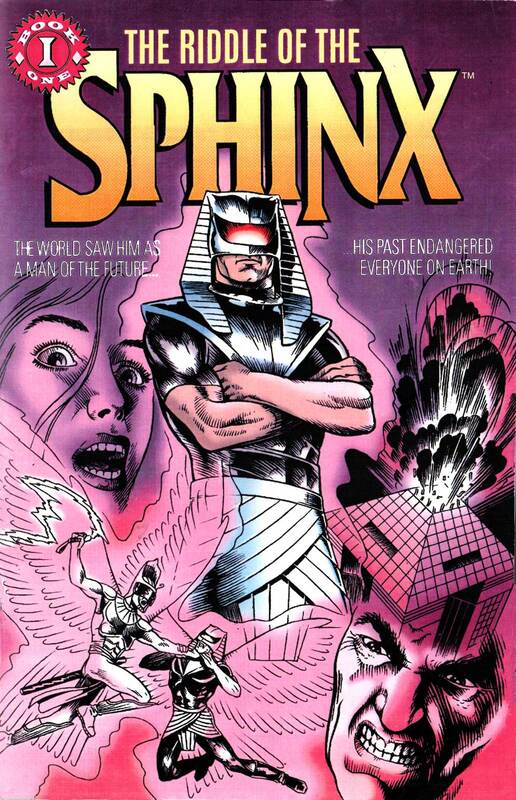 I thought it would be a good idea to showcase the Sphinx in the earlier issue, because The Riddle Of The Sphinx not only introduces us to Peter Chefren, a visitor from a parallel Earth, but also – SPOILER ALERT – features the “demise” of the character and the introduction of his replacement. This way, rather than having a “one and done” appearance, we established something of a Silver Age history for Chefren to appear in other stories and also in the upcoming (at the time) History of Big Bang Comics. 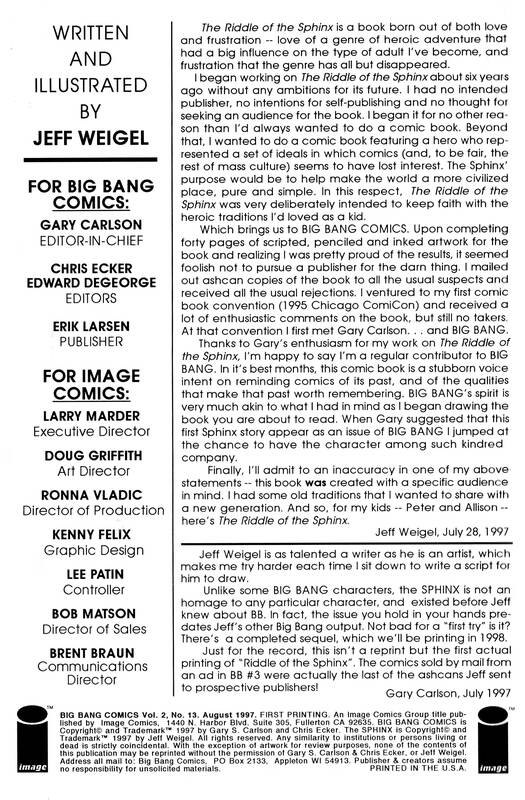 Jeff has been a major part of Big Bang Comics up to the present day, recently providing the cover for Big Bang Universe #3, published by AC Comics. 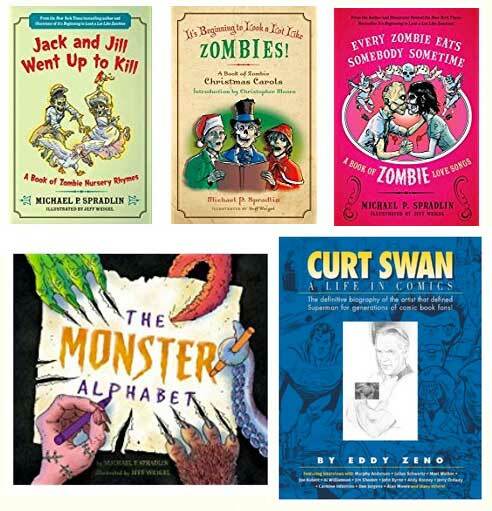 He has also written and illustrated multiple children’s books and graphic novels, including Dragon Girl: The Secret Valley, Thunder From The Sea, Atomic Ace (He’s Just My Dad) and Atomic Ace and the Robot Rampage. 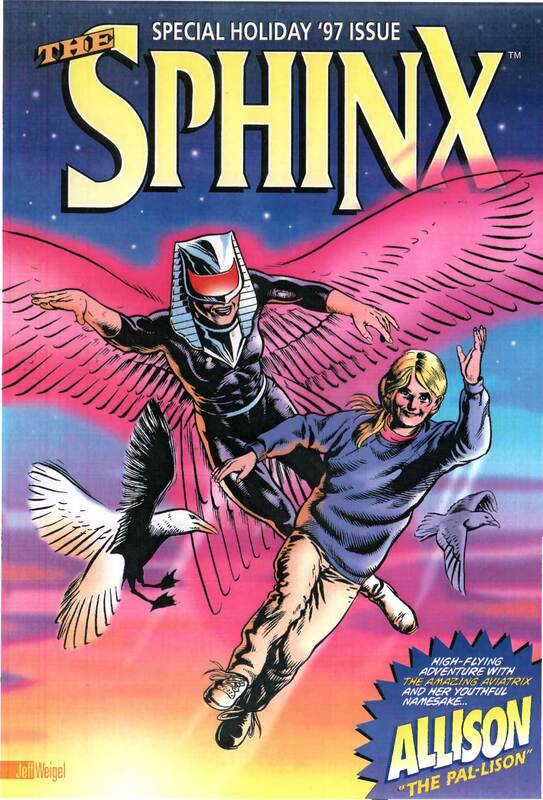 The Sphinx trade paperback collects all of the BB stories, as well as some other goodies. (Pictured here are color versions of covers Jeff drew for his kids in 1997). Jeff art directed and designed the book Curt Swan: A Life In Comics by Eddy Zeno, a deluxe hardcover career retrospective of the late, great Superman artist. He also illustrated SMASH!, a non-fiction graphic novel written by Sara Latta that explains the science behind the Large Hadron Collider, The Monster Alphabet by Michael P. Spradlin, as well as Spradlin’s New York Times bestseller It’s Beginning To Look A Lot Like Zombies: A Book Of Zombie Christmas Carols and the follow-ups, Every Zombie Eats Somebody Sometime: A Book of Zombie Love Songs and Jack and Jill Went Up to Kill: A Book of Zombie Nursery Rhymes. He also authored, illustrated and designed STOP MATH, an interactive storybook app for iPad. All of the above books are fun and available online from Amazon. Check them out. The Atomic Ace books especially will appeal to just about any Big Bang Comics fan. Next time: Part 2 of the Savage Dragon TimeBomber epic from BB #14. Big Bang Comics and related characters are © and TM Gary S. Carlson and Chris Ecker. 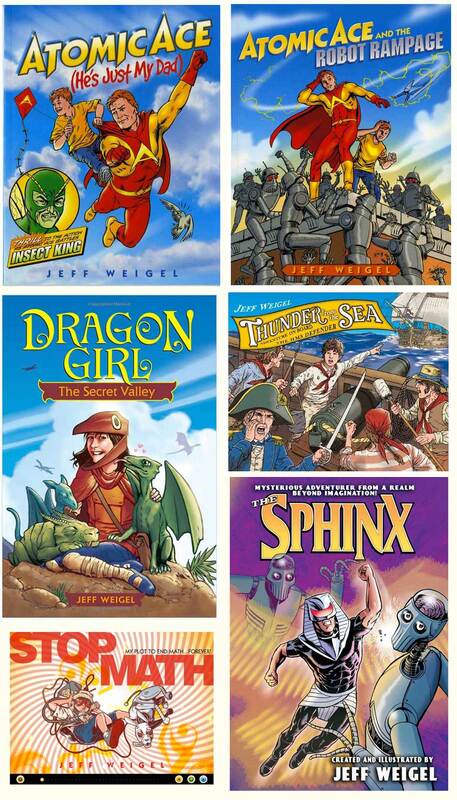 The Sphinx, Atomic Ace, Dragon Girl and related characters are © and TM Jeff Weigel. 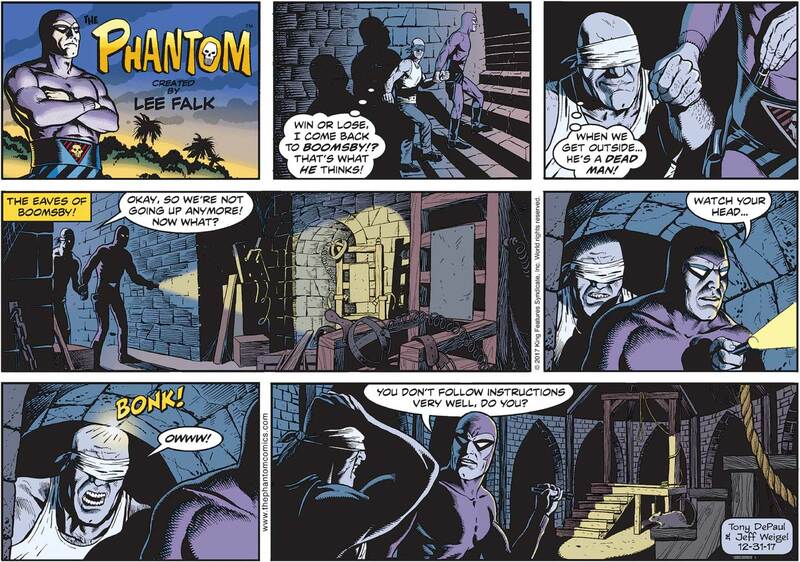 The Phantom is © and TM King Features Syndicate.